Welcome Students to the course LV 706.315 class of summer term 2019! This course is an extension of the last years “Methods of explainable AI”, which was a natural offspring of the interactive Machine Learning (iML) courses and the decision making courses held over the last years. Today the most successful AI/machine learning models, e.g. deep learning (see the difference AI-ML-DL) are often considered to be “black-boxes” making it difficult to re-enact and to answer the question of why a certain machine decision has been reached. A general serious drawback is that statistical learning models have no explicit declarative knowledge representation. That means such models have enormous difficulty in generating underlying explanatory structures. This limits their ability to understand the context. Here the human-in-the-loop is exceptional good and as our goal is to augment the human intelligence with artificial intelligence we should rather speak of having a computer-in-the-loop. This is not necessary in some application domains (e.g. autonomous vehicles), but it is essential in our application domain, which is the medical domain (see our digital pathology project). A medical doctor is required on demand to retrace a result in an human understandable way. This calls not only for explainable models, but also for explanation interfaces (see AK HCI course). Interestingly, early AI systems (rule based systems) were explainiable to a certain extent within a well-defined problem space. Therefore this course will also provide a background on decision support systems from the early 1970ies (e.g. MYCIN, or GAMUTS of Radiology). In the class of 2019 we will focus even more on making inferences from observational data and reasoning under uncertainty which quickly bring us into the field of causality. Because in the biomedical domain (see e.g. our digital pathology project) we need to discover and understand unexpected interesting and relevant patterns in data to gain knowledge or for troubleshooting. This graduate course follows a research-based teaching (RBT) approach and provides an overview of selected current state-of-the-art methods on making AI transparent re-traceable, re-enactable, understandable, consequently explainable. Note: We speak Python. Research students of Computer Science particularly of the Holzinger group. Explainability is motivated due to lacking transparency of so-called black-box approaches, which do not foster trust  and acceptance of AI generally and ML specifically. Rising legal and privacy aspects, e.g. with the new European General Data Protection Regulations (GDPR, which is now in effect since May 2018) will make black-box approaches difficult to use in Business, because they often are not able to explain why a machine decision has been made (see explainable AI). Consequently, the field of Explainable AI is recently gaining international awareness and interest (see the news blog), because raising legal, ethical, and social aspects make it mandatory to enable – on request – a human to understand and to explain why a machine decision has been made [see Wikipedia on Explainable Artificial Intelligence]. Note: that does not mean that it is always necessary to explain everything and all – but to be able to explain it if necessary – e.g. for general understanding, for teaching, for learning, for research – or in court – or even on demand by a citizen – right of explanabiltiy. Andreas Holzinger (2013). 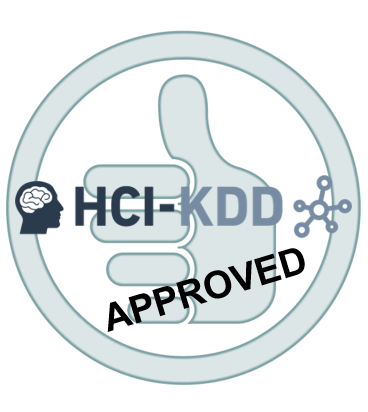 Human–Computer Interaction and Knowledge Discovery (HCI-KDD): What is the benefit of bringing those two fields to work together? In: Cuzzocrea, Alfredo, Kittl, Christian, Simos, Dimitris E., Weippl, Edgar & Xu, Lida (eds.) Multidisciplinary Research and Practice for Information Systems, Springer Lecture Notes in Computer Science LNCS 8127. Heidelberg, Berlin, New York: Springer, pp. 319-328, doi:10.1007/978-3-642-40511-2_22. Marco Tulio Ribeiro, Sameer Singh & Carlos Guestrin 2016. Model-Agnostic Interpretability of Machine Learning. arXiv:1606.05386. Himabindu Lakkaraju, Ece Kamar, Rich Caruana & Jure Leskovec 2017. Interpretable and Explorable Approximations of Black Box Models. arXiv:1707.01154. Grégoire Montavon, Wojciech Samek & Klaus-Robert Müller 2017. Methods for interpreting and understanding deep neural networks. arXiv:1706.07979. Luisa M. Zintgraf, Taco S. Cohen, Tameem Adel & Max Welling 2017. Visualizing deep neural network decisions: Prediction difference analysis. arXiv:1702.04595. Matthew D. Zeiler & Rob Fergus 2014. Visualizing and understanding convolutional networks. In: Fleet, D., Pajdla, T., Schiele, B. & Tuytelaars, T. (eds.) ECCV, Lecture Notes in Computer Science LNCS 8689. Cham: Springer, pp. 818-833, doi:10.1007/978-3-319-10590-1_53. Aravindh Mahendran & Andrea Vedaldi. Understanding deep image representations by inverting them. Proceedings of the IEEE conference on computer vision and pattern recognition, 2015. 5188-5196, doi:10.1109/CVPR.2015.7299155. Jost Tobias Springenberg, Alexey Dosovitskiy, Thomas Brox & Martin Riedmiller 2014. Striving for simplicity: The all convolutional net. arXiv:1412.6806. Been Kim, Martin Wattenberg, Justin Gilmer, Carrie Cai, James Wexler & Fernanda Viegas. Interpretability beyond feature attribution: Quantitative testing with concept activation vectors (tcav). International Conference on Machine Learning, ICML 2018. 2673-2682, Stockholm. Rich Caruana, Yin Lou, Johannes Gehrke, Paul Koch, Marc Sturm & Noemie Elhadad. Intelligible models for healthcare: Predicting pneumonia risk and hospital 30-day readmission. 21th ACM SIGKDD International Conference on Knowledge Discovery and Data Mining (KDD ’15), 2015 Sydney. ACM, 1721-1730, doi:10.1145/2783258.2788613. Andreas Holzinger, et al. 2018. Interactive machine learning: experimental evidence for the human in the algorithmic loop. Applied Intelligence, doi:10.1007/s10489-018-1361-5. Karen Simonyan, Andrea Vedaldi & Andrew Zisserman 2013. Deep inside convolutional networks: Visualising image classification models and saliency maps. arXiv:1312.6034. David Baehrens, Timon Schroeter, Stefan Harmeling, Motoaki Kawanabe, Katja Hansen & Klaus-Robert Mãžller 2010. How to explain individual classification decisions. Journal of Machine Learning Research, 11, (Jun), 1803-1831. Avanti Shrikumar, Peyton Greenside & Anshul Kundaje 2017. Learning important features through propagating activation differences. arXiv:1704.02685. Ramprasaath R. Selvaraju, Michael Cogswell, Abhishek Das, Ramakrishna Vedantam, Devi Parikh & Dhruv Batra. Grad-CAM: Visual Explanations from Deep Networks via Gradient-Based Localization. ICCV, 2017. 618-626. Judea Pearl 1988. Evidential reasoning under uncertainty. In: Shrobe, Howard E. (ed.) Exploring artificial intelligence. San Mateo (CA): Morgan Kaufmann, pp. 381-418. Matt J. Kusner, Joshua Loftus, Chris Russell & Ricardo Silva. Counterfactual fairness. In: Guyon, Isabelle, Luxburg, Ulrike Von, Bengio, Samy, Wallach, Hanna, Fergus, Rob & Vishwanathan, S.V.N., eds. Advances in Neural Information Processing Systems 30 (NIPS 2017), 2017. 4066-4076. Judea Pearl 2009. Causality: Models, Reasoning, and Inference (2nd Edition), Cambridge, Cambridge University Press. Judea Pearl 2018. Theoretical Impediments to Machine Learning With Seven Sparks from the Causal Revolution. arXiv:1801.04016. Andrew T. Duchowski 2017. Eye tracking methodology: Theory and practice. Third Edition, Cham, Springer, doi:10.1007/978-3-319-57883-5. Christian Stickel, Martin Ebner, Silke Steinbach-Nordmann, Gig Searle & Andreas Holzinger 2009. Emotion Detection: Application of the Valence Arousal Space for Rapid Biological Usability Testing to Enhance Universal Access. In: Stephanidis, Constantine (ed.) Universal Access in Human-Computer Interaction. Addressing Diversity, Lecture Notes in Computer Science, LNCS 5614. Berlin, Heidelberg: Springer, pp. 615-624, doi:10.1007/978-3-642-02707-9_70. Topic 01: What is a good explanation? Zachary C. Lipton 2016. The mythos of model interpretability. arXiv:1606.03490. Ronald Stamper 1988. Pathologies of AI: Responsible use of artificial intelligence in professional work. AI & society, 2, (1), 3-16, doi: 10.1007/BF01891439. BETA = Black Box Explanation through Transparent Approximation, a post-hoc explainability method developed by Lakkarju, Bach & Leskovec (2016) it learns two-level decision sets, where each rule explains the model behaviour. Himabindu Lakkaraju, Ece Kamar, Rich Caruana & Jure Leskovec 2017. Interpretable and Explorable Approximations of Black Box Models. arXiv:1707.01154. Deep Taylor Decomposition = Grégoire Montavon, Wojciech Samek & Klaus-Robert Müller 2017. Methods for interpreting and understanding deep neural networks. 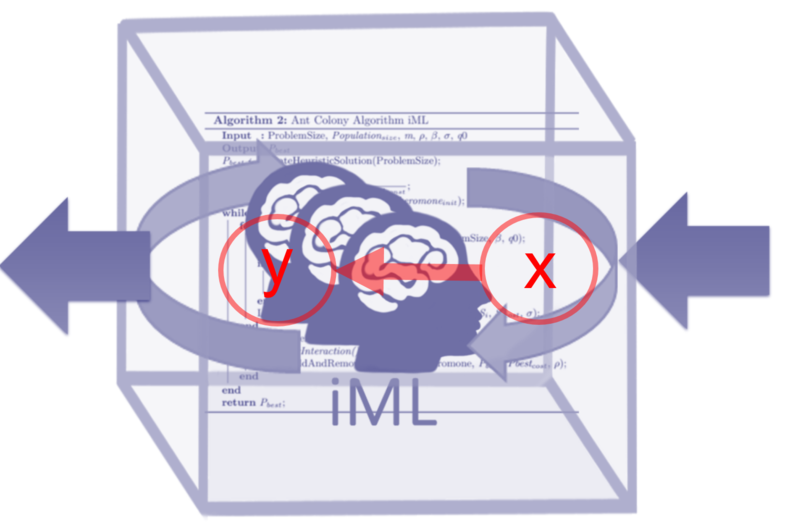 arXiv:1706.07979.
iML = interactive Machine Learning with the Human-in-the-Loop is a versatile ante-hoc method for making use of the contextual understanding of a human expert complementing the machine learning alogrihtms; Andreas Holzinger et al. 2018. Interactive machine learning: experimental evidence for the human in the algorithmic loop. Springer/Nature Applied Intelligence, doi:10.1007/s10489-018-1361-5. LIME = Local Interpretable Model-Agnostic Explanations is a universally useable tool; Marco Tulio Ribeiro, Sameer Singh & Carlos Guestrin 2016. Model-Agnostic Interpretability of Machine Learning. arXiv:1606.05386. Andreas Holzinger, Markus Plass, Katharina Holzinger, Gloria Cerasela Crisan, Camelia-M. Pintea & Vasile Palade (2017). A glass-box interactive machine learning approach for solving NP-hard problems with the human-in-the-loop. arXiv:1708.01104. Andreas Holzinger (2016). Interactive Machine Learning for Health Informatics: When do we need the human-in-the-loop? Brain Informatics, 3, (2), 119-131, doi:10.1007/s40708-016-0042-6. Andreas Holzinger (2018). Explainable AI (ex-AI). Informatik-Spektrum, 41, (2), 138-143, doi:10.1007/s00287-018-1102-5. Katharina Holzinger, Klaus Mak, Peter Kieseberg & Andreas Holzinger 2018. Can we trust Machine Learning Results? Artificial Intelligence in Safety-Critical decision Support. ERCIM News, 112, (1), 42-43. Ante-hoc Explainability (AHE) := such models are interpretable by design, e.g. glass-box approaches; typical examples include linear regression, decision trees/lists, random forests, Naive Bayes and fuzzy inference systems; or GAMs, Stochastic AOGs, and deep symbolic networks; they have a long tradition and can be designed from expert knowledge or from data and are useful as framework for the interaction between human knowledge and hidden knowledge in the data. BETA := Black Box Explanation through Transparent Approximation, developed by Lakkarju, Bach & Leskovec (2016) it learns two-level decision sets, where each rule explains the model behaviour. Decomposition := process of resolving relationships into the consituent components (hopefully representing the relevant interest). Highly theoretical, because in real-world this is hard due to the complexity (e.g. noise) and untraceable imponderabilities on our observations. Explanatory power := is the ability of a set hypothesis to effectively explain the subject matter it pertains to (opposite: explanatory impotence). European General Data Protection Regulation (EU GDPR) := Regulation EU 2016/679 – see the EUR-Lex 32016R0679 , will make black-box approaches difficult to use, because they often are not able to explain why a decision has been made (see explainable AI). Gradient := a vector providing the direction of maximum rate of change. Interactive Machine Learning (iML) := machine learning algorithms which can interact with – partly human – agents and can optimize its learning behaviour trough this interaction. Holzinger, A. 2016. Interactive Machine Learning for Health Informatics: When do we need the human-in-the-loop? Brain Informatics (BRIN), 3, (2), 119-131. Inverse Probability:= an older term for the probability distribution of an unobserved variable, and was described by De Morgan 1837, in reference to Laplace’s (1774) method of probability. Post-hoc Explainability (PHE) := such models are designed for interpreting black-box models and provide local explanations for a specific decision and re-enact on request, typical examples include LIME, BETA, LRP, or Local Gradient Explanation Vectors, prediction decomposition or simply feature selection. Preference learning (PL) := concerns problems in learning to rank, i.e. learning a predictive preference model from observed preference information, e.g. with label ranking, instance ranking, or object ranking. Fürnkranz, J., Hüllermeier, E., Cheng, W. & Park, S.-H. 2012. Preference-based reinforcement learning: a formal framework and a policy iteration algorithm. Machine Learning, 89, (1-2), 123-156. Multi-Agent Systems (MAS) := include collections of several independent agents, could also be a mixture of computer agents and human agents. An exellent pointer of the later one is: Jennings, N. R., Moreau, L., Nicholson, D., Ramchurn, S. D., Roberts, S., Rodden, T. & Rogers, A. 2014. On human-agent collectives. Communications of the ACM, 80-88. Transfer Learning (TL) := The ability of an algorithm to recognize and apply knowledge and skills learned in previous tasks to novel tasks or new domains, which share some commonality. Central question: Given a target task, how do we identify the commonality between the task and previous tasks, and transfer the knowledge from the previous tasks to the target one? Pan, S. J. & Yang, Q. 2010. A Survey on Transfer Learning. IEEE Transactions on Knowledge and Data Engineering, 22, (10), 1345-1359, doi:10.1109/tkde.2009.191.